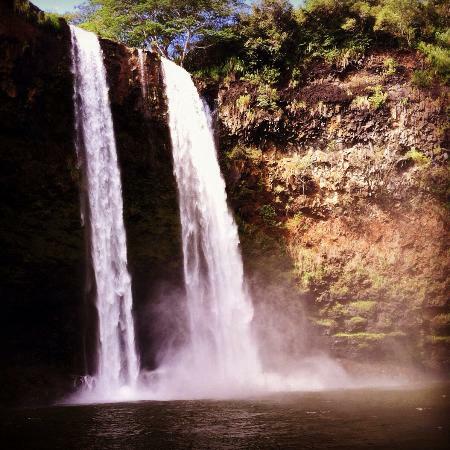 My husband and I have been to Kauai four times and we already have our reservations for next year. 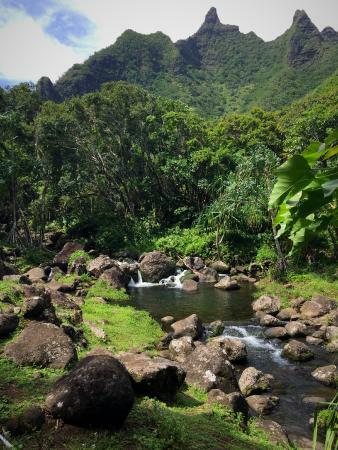 Kauai's beaches are superb, but what keeps us coming back is all the natural beauty and a laid-back vibe that is very relaxing. 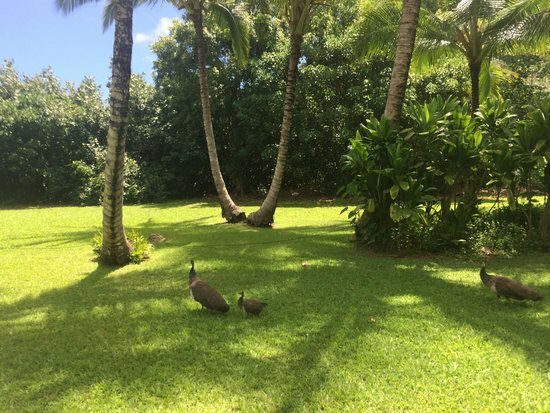 In this guide I'll be sharing info on the botanical gardens, hikes, attractions and activities we have enjoyed in Kauai. 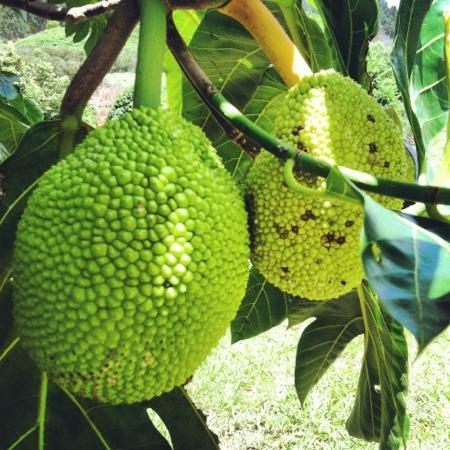 Food is expensive in Hawaii, but farmer's markets are plentiful. If you book lodging with a microwave and refrigerator it can really help out your budget. 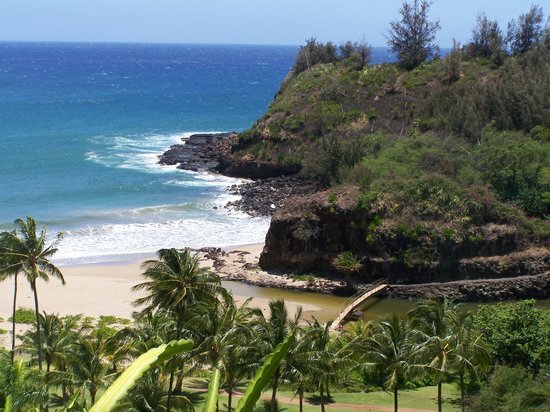 Although there are some hiking trails and lovely bike paths, you will need to rent a car if you really want to see all the beauty Kauai has to offer. The creators of this mini-golf course did more than design an interesting course. 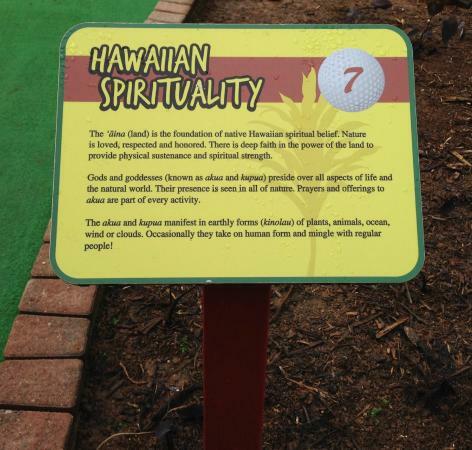 They added beautiful tropical landscaping and -- a touch I've never seen elsewhere -- signs explaining Hawaiian spirituality and history. I'm an avid reader of guide books, but I learned a lot reading the signs at this mini-golf. 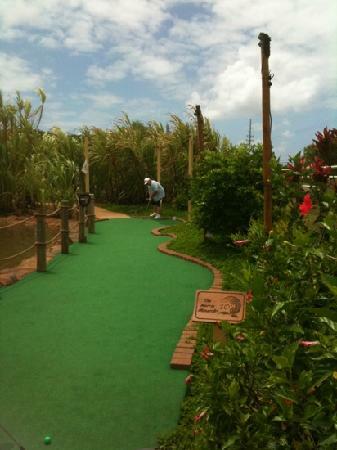 There is also the Wai Koa Loop Trail that starts just behind the mini-golf. You can walk or ride dirt bikes on this trail through acres of mahogany trees, but they request you sign-in at the same office area that houses the mini-golf cashier. 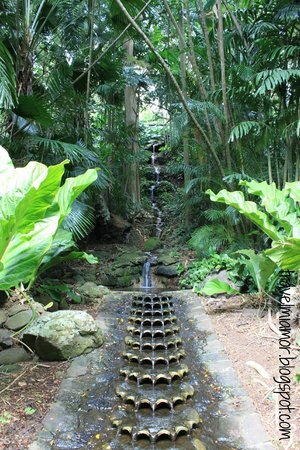 This tropical garden is smaller and the plantings are younger (not as big and 'lush') than some other gardens, and there are no sculptures or water features, but they have added a unique dimension to their tours -- TASTE! Here is your chance to sample local honey and fruits. 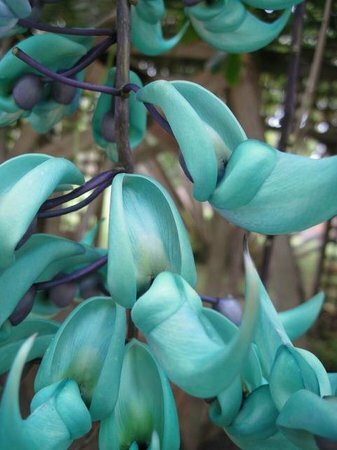 What seriously sets them apart from other botanical gardens is their chocolate sampling at the end of the tour. This is far more than just having samples sitting out for people to nibble. You are guided through comparisons between different types of chocolate -- checking not only taste, but scent and texture as well. Although only one or two of the chocolate samples on offer was made on premises, that didn't diminish our enjoyment of the experience. It gave us a chance to learn how chocolate is made and really think about chocolate in a new way -- its cacao content, its TEXTURE, and even its 'terroir' (not sure if I spelled it right). 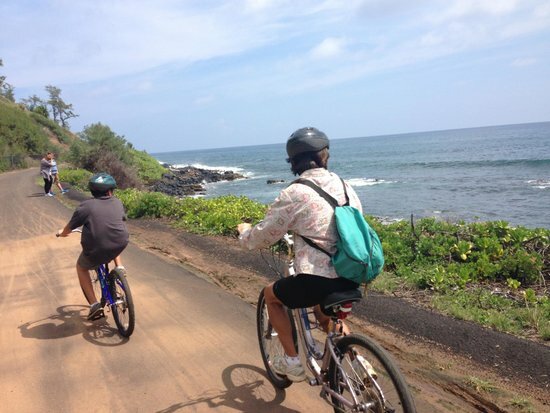 Don't miss the opportunity to ride a bike on the Kauai Path (also called the Coastal Path). 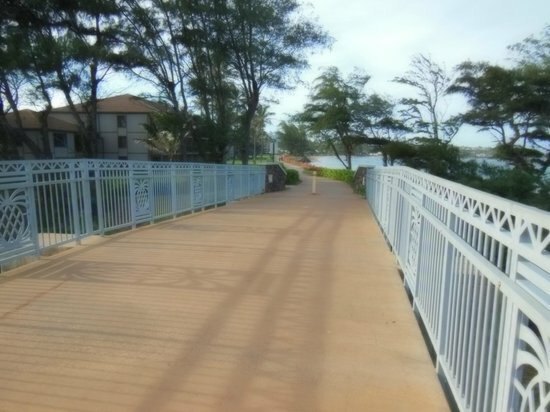 This well-paved bike path is completely separate from car traffic and takes you right next to the ocean. 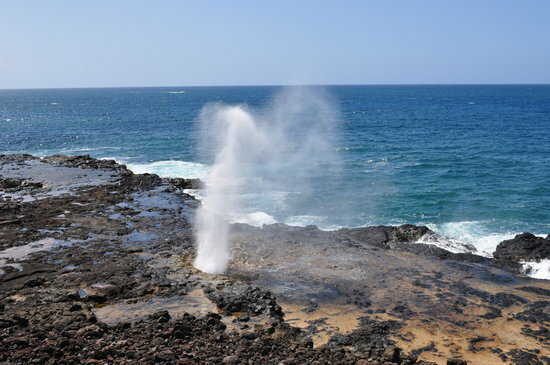 There are a few public restrooms and several beaches you can access without leaving the trail. 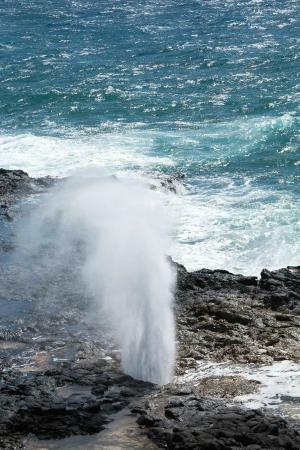 Between Kealia Beach and Kapaa there is a wonderful overlook for whale watching. There are signs in the area telling you about the whales. We saw quite a few in January. 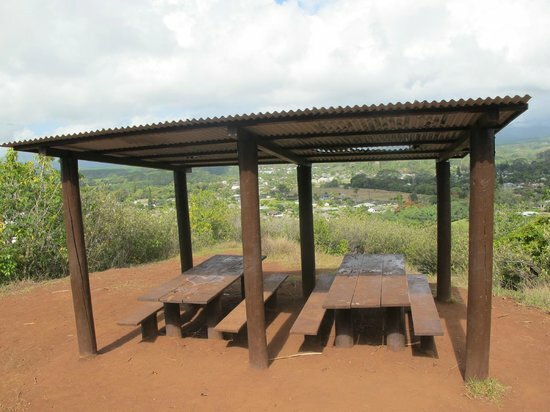 There are also several picnic shelters along the way. This path is not flat but not terribly steep either. I'm out of shape but have no trouble. The views are stunning. Rent a bike lock if you plan to go swimming at one of the beaches. Lots of places rent colorful bikes in Kapaa, most have unweildly wide handle bars and a wobbly feel to them. We prefer to rent a bike from Kauai Cycle on Kuhio Highway in Kapaa. 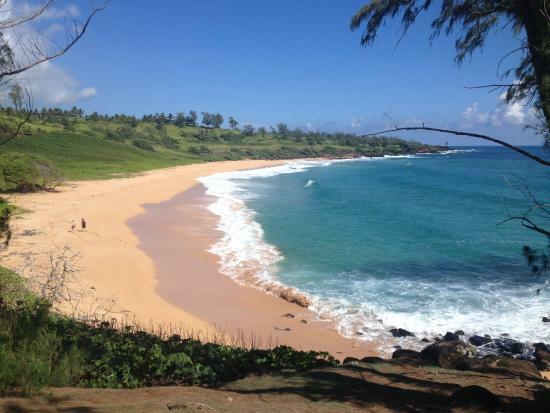 If you want to swim, I think this is the best beach in Kauai. 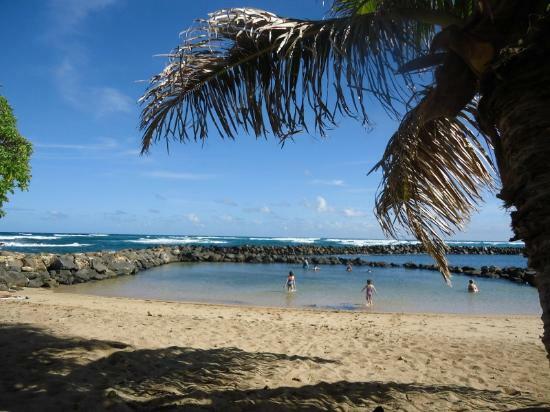 There are three types of beach experience here: an enclosed shallow area for children, an enclosed area deep enough for adults to swim and snorkel, and unenclosed ocean for more adventurous swimmers. 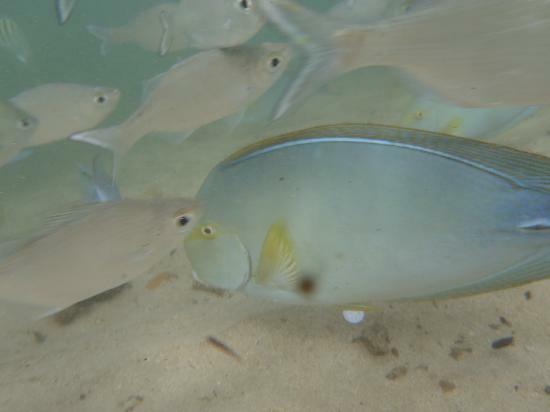 The enclosures are made of giant rocks that keep the large waves away, and yet there is enough flow that the water is exchanged and lots of fish are there for snorkellers to view. Some people feed the fish (there seems to be a debate over whether or not this should be done) which ensures there will be lots of fish for you to see and there is a large sign with color photos of the types of fish you are most likely to find. 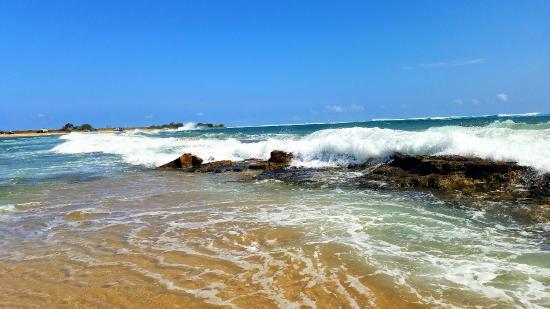 Like all the beaches on Kauai, this beach is free. Parking is free. It is vendor-free. There is shade. 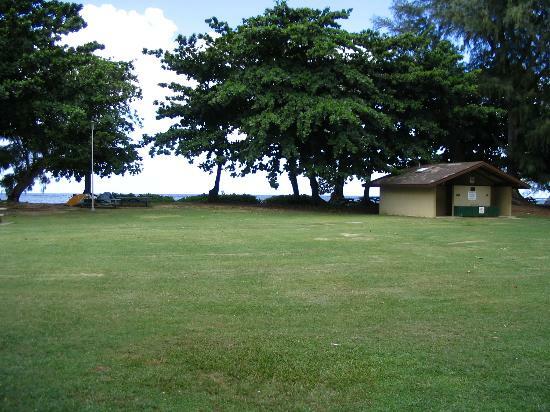 This beach has a lifeguard, outdoor showers and covered picnic pavillions. In the park is a very large playground for children. Bring your own food as there is none for sale here. 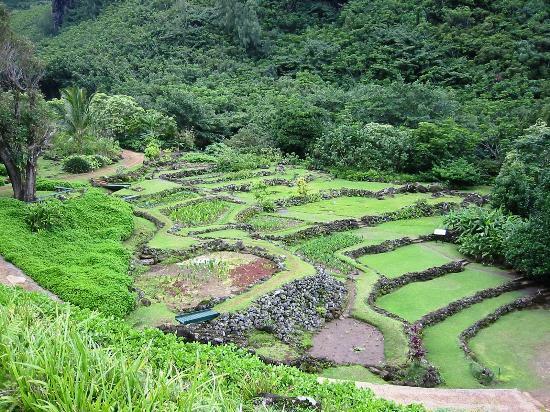 Less well known is an HEIAU area. 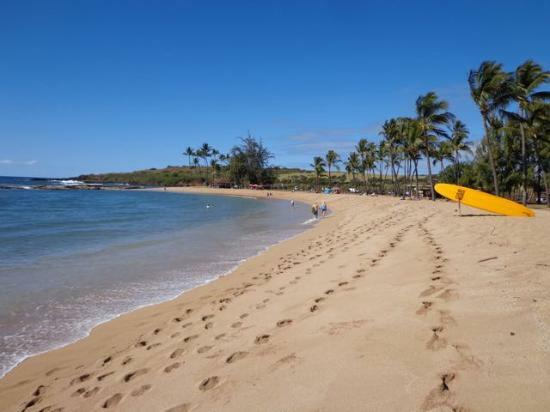 This beach was once part of a sacred area for the ancient Hawaiians. 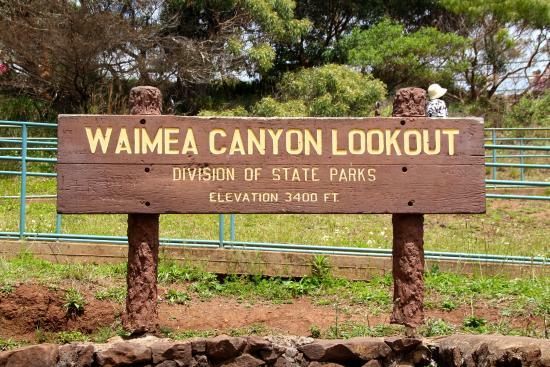 The remnants of this Hikinaakala are off limits to tourists, but the remaining stones can be seen and the signage explains the history and some of the significance of the area. 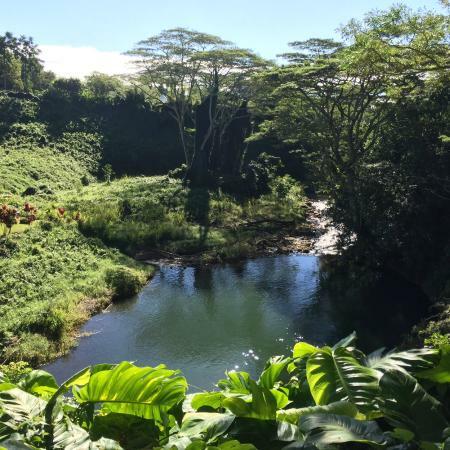 This area is on the end of the park closest to the bridge that crosses over the Wailua River. Love the juice here. 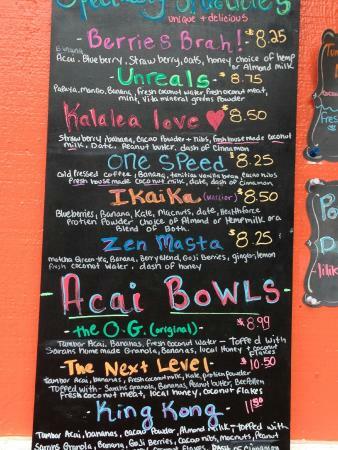 It is our favorite juice stand on the island. Plus it has a gorgeous view of the mountains! 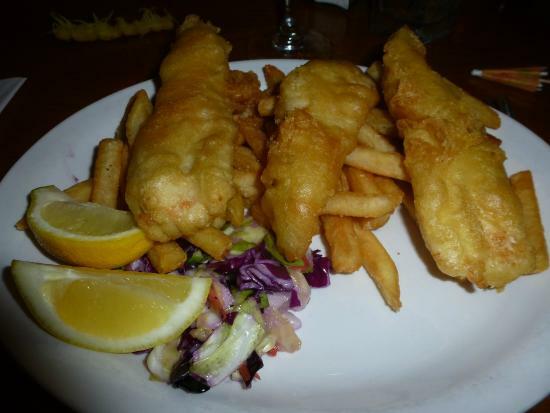 We have found a surprising number of restaurants on Kauai where you can't get grilled fish, only fried fish. So when we asked out server at Bouchons if we could get our 'fish and chips' with the fish grilled, instead of battered and fried, we were delighted to find they were willing to do that. 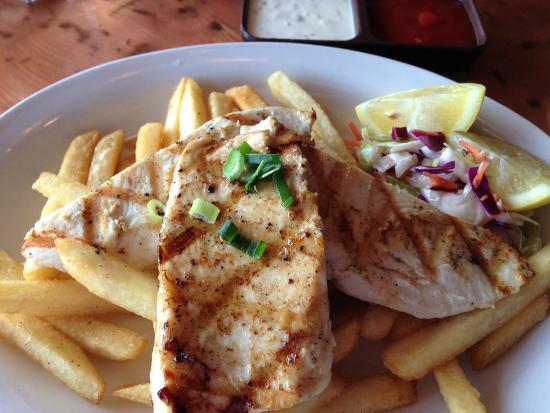 The fish was fresh and grilled to perfection. They also have a dedicated sushi bar and sushi chef at one end of their dining room. They also have a nice selection of beverages, both with and without alcohol. It is on the second level but there is an elevator if needed. 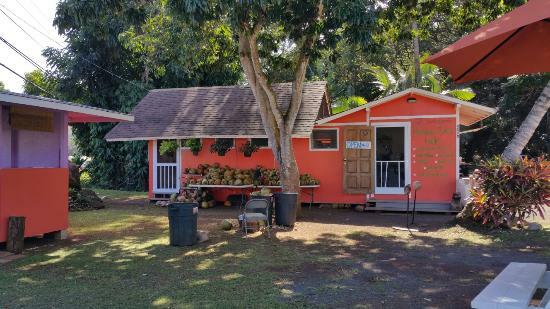 This restaurant is located within walking distance of Hanalei Beach and is surrounded by several shops and a grocery store. This is an interesting cultural site. 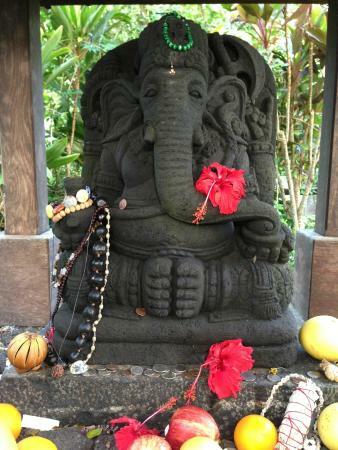 In Japan there is an island named Shikoku, which has been a place of Buddhist pilgimage for several centuries. The entire circuit in Japan is approximately 800 miles. 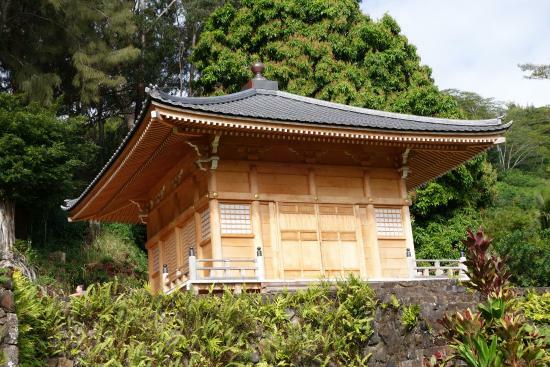 In 1904 Japanese immigrants to Hawaii sought to recreate this pilgrimage route by creating 88 miniature shrines on the side of a hill in the lush Lawai valley. 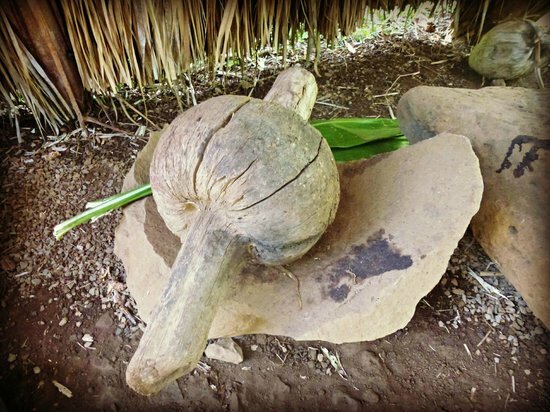 It is believed that the site had been used for religious purposes by the ancient Hawaiians before them, but it is unclear what evidence supports this belief. 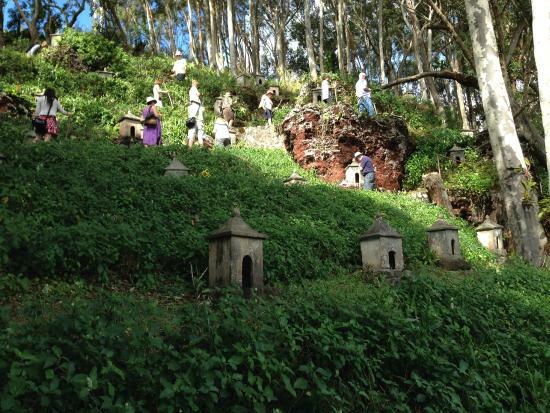 The steep zigzag path to visit these shrines became disused roughly around 1960 when the pineapple cannery closed. A dedicated group of volunteers decided to reclaim the site and it became open to the public in late 2013. As of January 2015 it was open only the second and last Sundays of each month for tours at 10am, noon and 2pm. It is a little tricky to find -- you turn off the main highway onto a tiny road that almost looks like a driveway from the main highway. This tiny road is quite close to the turn off for Koloa and really only wide enough for one car. But at least you only have to drive on it a short while before parking in a field. We were warmly received and greeted with a warm cup of jasmine tea and a small tea cake. You start with an introductory lecture -- which was informative and well-organized. Then you are free to go into the recently constructed Buddhist temple to meditate and/or traverse the mini-pilgrimage with a stout walking staff. This path through the shrines is quite steep and narrow in many places. This site is not generally staffed and only open to the public once or twice a month, so check ahead. Included in the price of admission is an amazing booklet that is very descriptive of the major plants you will see as well as the history of the people living in this valley. It is thoughtfully arranged so you can educate yourself while you walk around the grounds. I recommend reading it as you go!!! 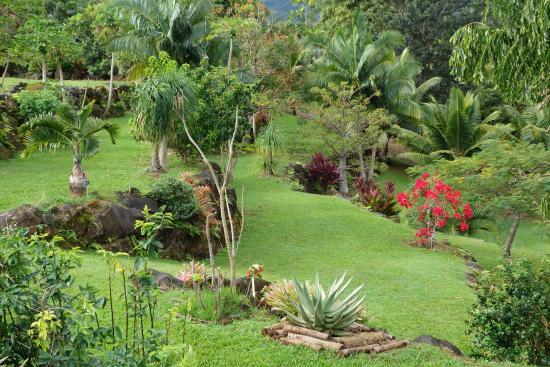 You will learn about the traditional Hawaiian lifestyle as well as the plants because they are so intertwined. 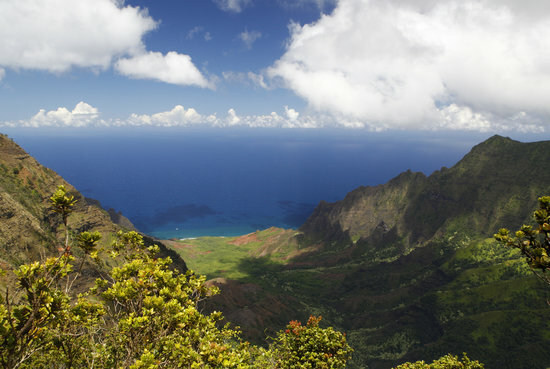 The views of the Makana mountain range and the Pacific Ocean are incomparable. Benches and water stations are provided along the self-guided trail. They warned us about mosquitos but we didn't use any spray and were not bothered by any bugs (it was January). Note: I am combining Allerton and McBryde Gardens in this review because they are contiguous with each other and you pay for both at the same cashier place. 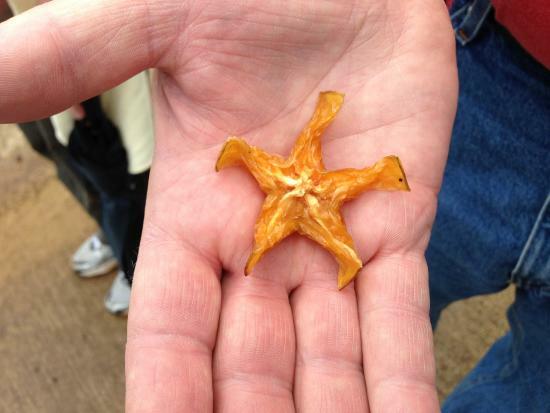 First -- I want to give a shout out to the guides on these tours. 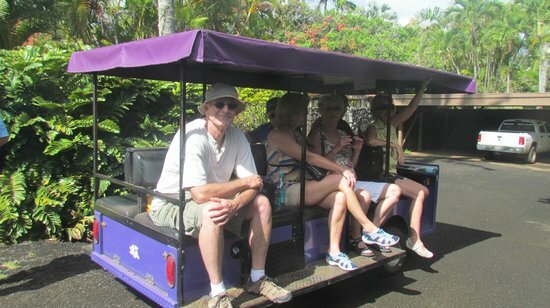 We have taken eight tours here and each and every guide has been extremely knowledgeable and articulate. They do not speak from a 'canned script.' Second -- if you are looking for LUSH, large mature trees and shrubbery this is the place to find it. The Allertons bought this place in the 1930s and started planting most of the plants you will see today. 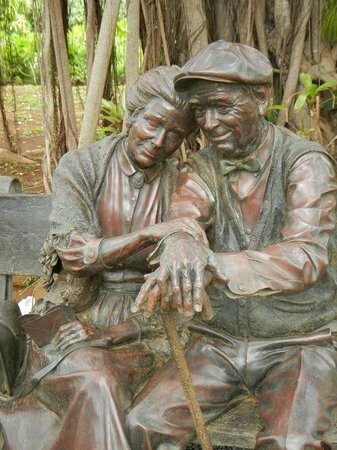 With Hawaii's climate these 70+ years are generations of growth. If you are a movie buff you will recognize many places in the gardens where parts of various films have been made. [Although if I ever go and find the gardens closed during MY vacation due to filming I will be inconsolable.] There are also many lovely water features and a few statues placed by the Allertons. My favorites are the Moreton Bay Fig Trees, brought from Australia and planted by the Allertons. 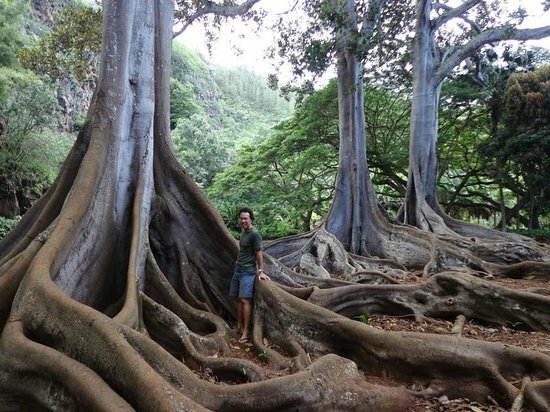 These giants have incredible root systems that fascinate me. They warn you a lot about insects and sell insect repellent where you buy tickets. We have never been bothered by insects there. If you don't like guided tours, you can take an open-ended self-guided tour in McBryde. They drop you off by tram and you can stay as long as you want as long as you return by the last tram pick up. This is ideal for us serious amateur photographers as we can spend as long as we like photographing a flower or section of bark. Unfortunately, the Moreton Bay Fig trees are not in this park of the gardens. 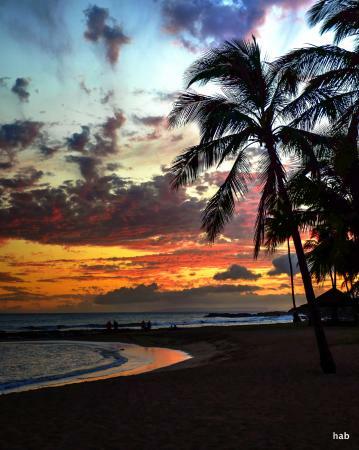 Treat yourself to a Sunset Allerton tour. 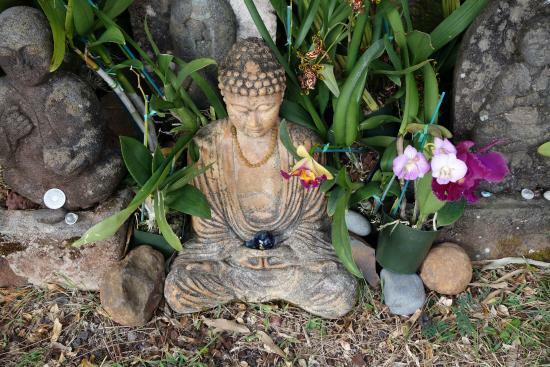 You will have the garden nearly all to yourself. It includes dinner on the patio of the Allerton home with an incredible view of the bay. If you are a serious photographer take the self-guided McBryde tour, you can take your tripod. If you are on a budget and can't afford a tour, just go to the entrance area and walk around -- there are lovely plantings there to rival many other gardens. And it is free. 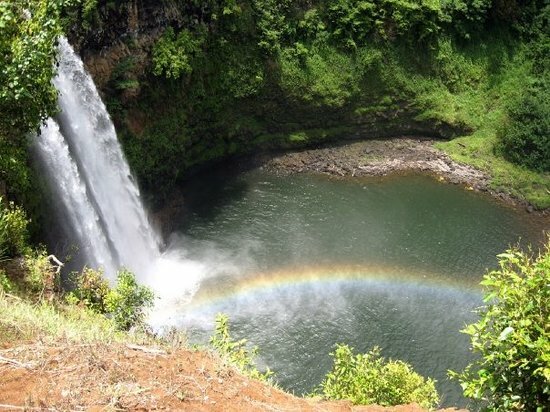 Actually this is one of the few places on Kauai that I don't recommend. It is a long drive to get there from anywhere (it appears to be surrounded by private land, although my map showed it as state park, but entrances were blocked). When you get to the falls the parking lot is quite small and you can barely turn around in it to leave. The view of the falls is limited and the area around the falls is not very picturesque. There is no educational signage about the falls either. There isn't even a walking path in the area once you get there. And no restroom. 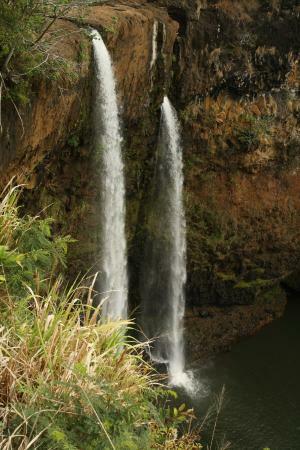 This is one of those 'iconic' sights of Kauai that you really must see, although it won't take very long. There is a nice local crafts market next to the parking lot. 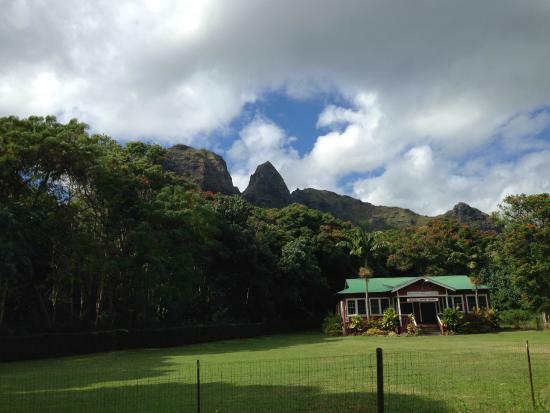 This is an 'iconic' sight of Kauai. But when you go, only go on a clear day. There will be nothing to see on a drizzly, rainy or foggy day. Try to go as early in the day as possible before the tour buses arrive. We were there at 8:30am and had the place to ourselves. 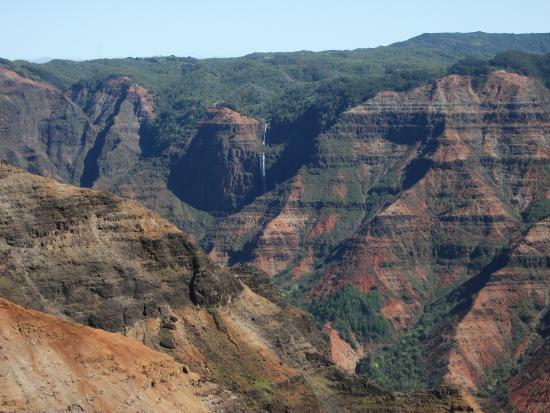 If you have driven this far into the interior, keep on driving to the Kalalau look out. 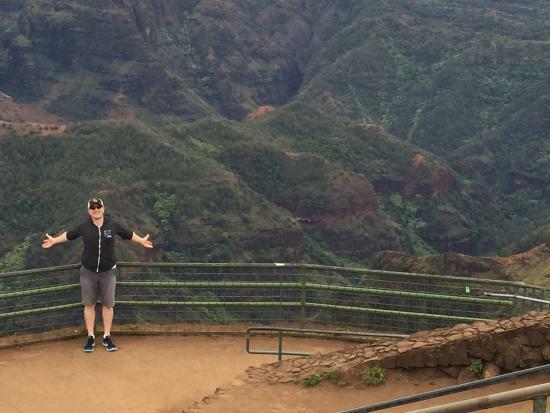 Truly stunning view of the NaPali coast. 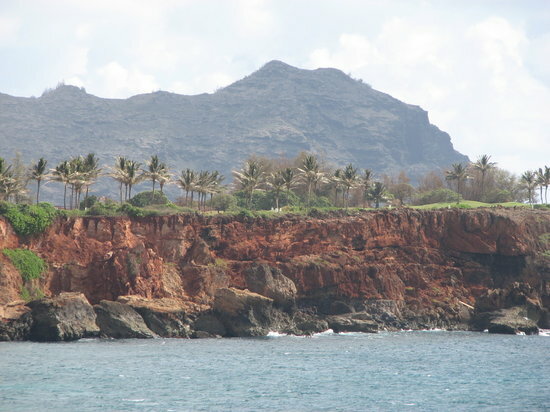 You will see the shape of the "Sleeping GIant" mountain as you drive around the island. Why not hike there? There are at least two trails, or branches of the trail. 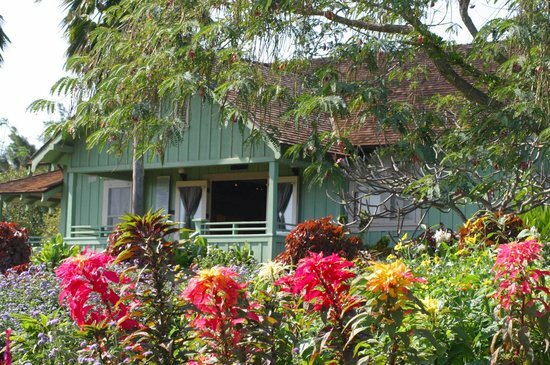 We chose the one with an entrance on Kamalu Road for the simple reason that there is a little parking area there. The trail starts off quite easy, a flat grassy path behind some nice houses, horses in a field. Then you cross a picturesque wooden bridge and then begins the ascent. Trail then gets steeper and steeper. And the vegetation thicker and the roots covering the trail more dense. We are in our early 60s and found this path fairly strenuous. 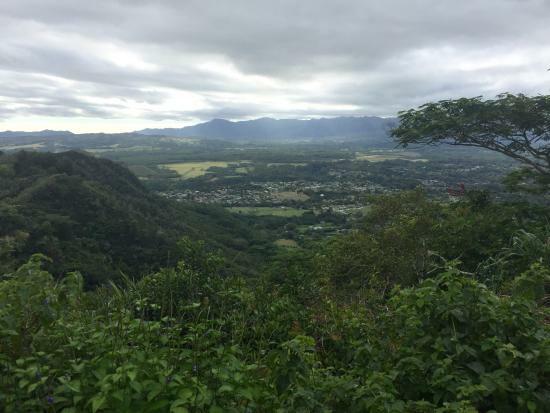 We only got as far as the lookout picnic point -- which has a wonderful view and makes a nice hike in and of itself without going to the top. We also saw some interesting petroglyphs on rocks along the trail, which we assume are authentic. My advice is -- do not undertake this trail without a map as there is more than one branch. And take plenty of water as there are no places to refill your water bottle. 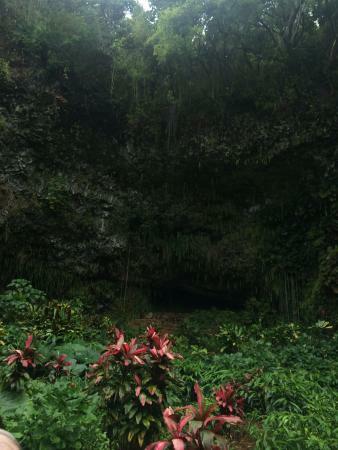 I've also seen this as part of the Makauwahi Cave Trail, which is a very interesting hiking trail to see to these cliffs. 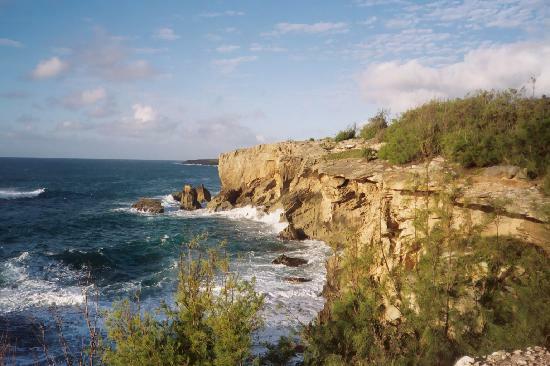 Gorgeous views of the ocean and of the cliffs. My husband, a geologist, enjoyed all the geological points of interest. Altough not terribly steep, some of the trail is deep sand, some is bare rock -- wear sturdy shoes, not open-toed sandals. I think this is a fairly unknown place as we never heard about it until our third visit and when we hiked it we saw very few other people. Park in the parking lot at "Shipwreck Beach" and start the trail there. Bring plenty of water as there is no place to buy water or refill a water bottle on the trail. Please see my review of the Allerton Garden as it is the same place. 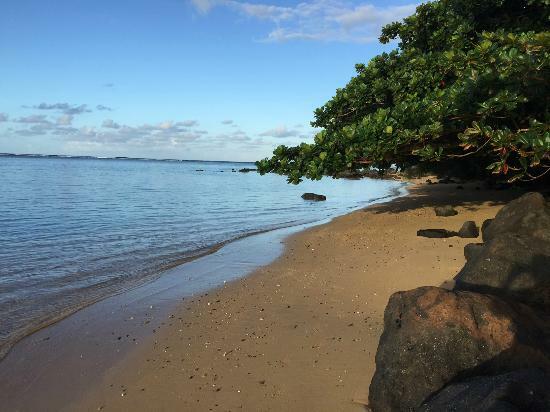 We love Anini Beach. 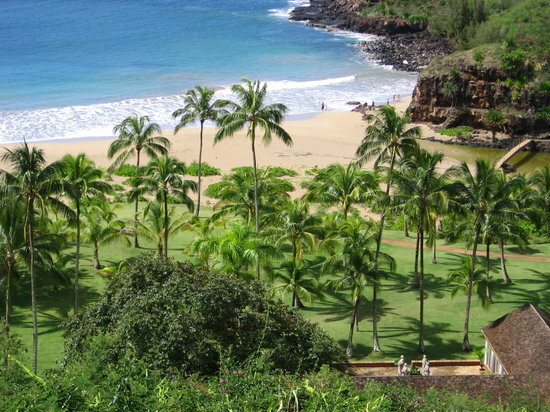 There are large lovely shade trees giving the place a nice 'park-like' feel and you can sit on the beach in sun or shade depending on your preference. The public restrooms are generally clean and there is an outdoor shower. There is often a food truck parking in the parking lot as well as covered picnic pavillions. The parking lot is good size. There is a natural coral breakwater about 1/4 mile out from the shore that keeps the water along the coast nice and calm. 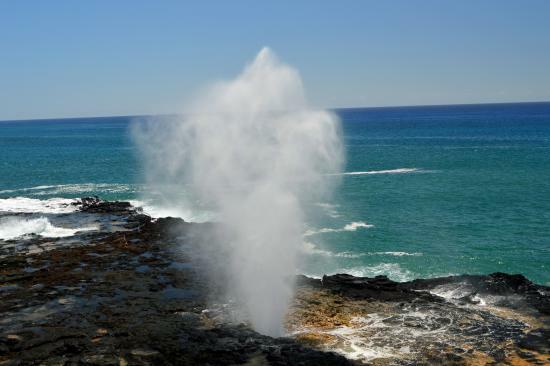 It is also quite shallow and the bottom is a combination of sand and coral making it difficult to walk on. 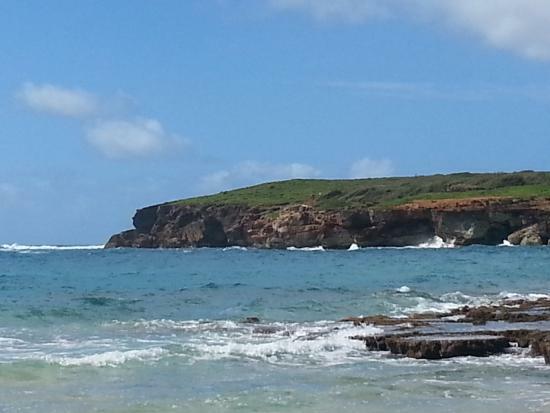 This all makes is an ideal place for paddle boarding and snorkelling. 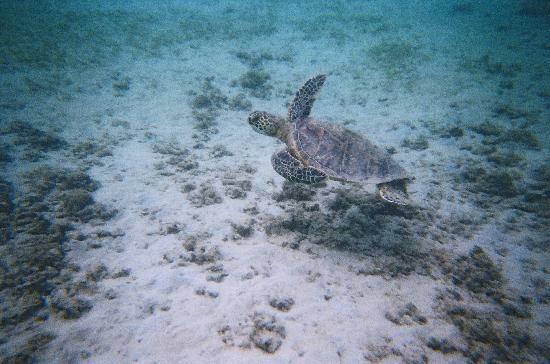 Lots of fish and sea turtles are frequently sighted there. It isn't really deep enough for adults to really get a good swim. The fern grotto itself isn't much to see, and the little walk from the boat to the fern grotto is meant to be a nature trail, but also isn't much to see. 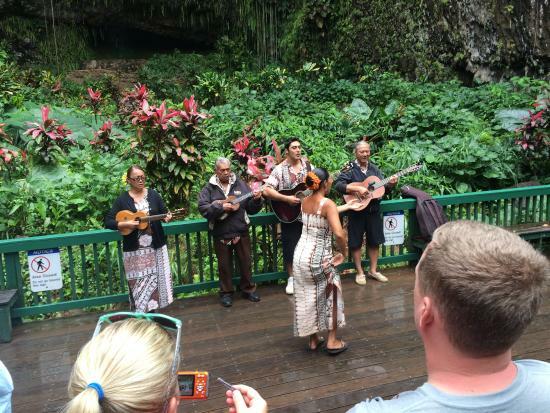 But the boat ride to the fern grotto gives you an opportunity to hear Hawaiian music sung and played on ukeles and provides a nice relaxing ride on the river. 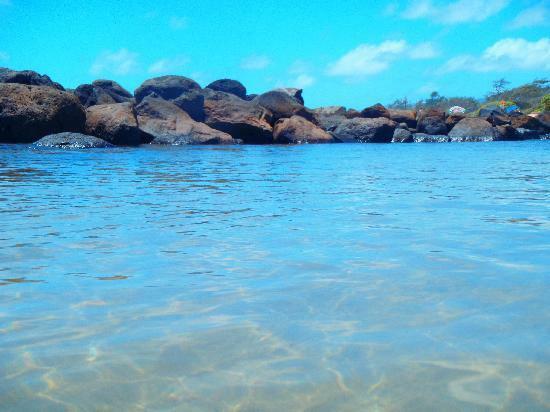 This is a good place for people with children to swim in a protected area. There are actually two 'view points' here. One at the parking lot of the falls and one across the street. Both are gorgeous views. There is also a restroom at the parking lot. 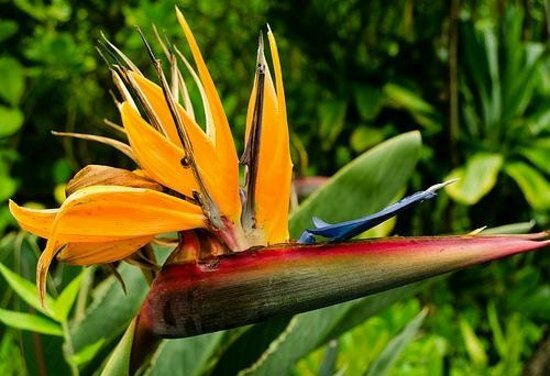 This botanical garden has the plethora of tropical plants you would expect at a botanical garden, but it also has dozens of interesting sculptures. They have several tours to choose from, but as far as I know they do not have any unguided ones that let you roam on your own. Which, for us amateur photographers, is a bit of a disappointment. 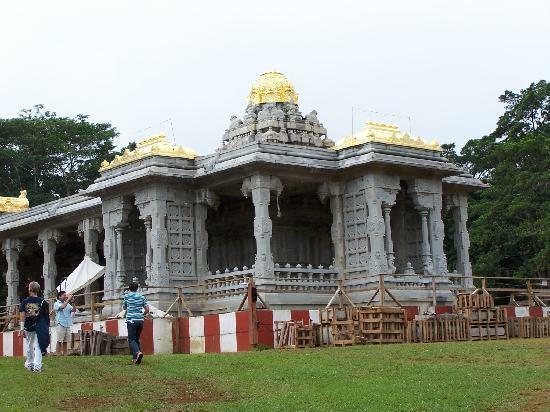 They also have a little recreated village and other areas of particular interest to children. My main disappointment with these gardens is that the tour guides are volunteers and as a result the quality of guides is 'uneven.' We had one who was excellent. If they have an unguided tour when you are there I would opt for that. This is a good place for Seniors as most of the tours are via little trams and if need be you can stay on the tram and skip the walking part. See my review of Allerton Gardens as, in my view, they are basically the same place. 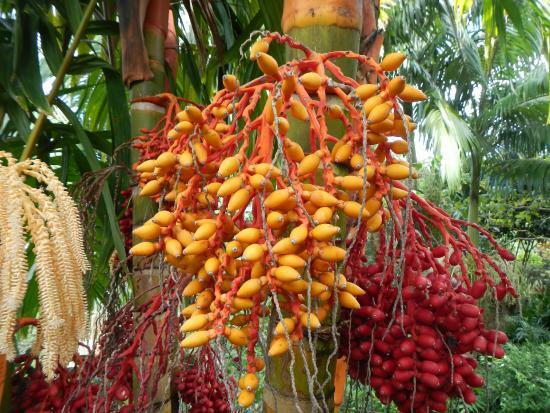 Do not miss the opportunity go to the Allerton/McBryde Tropical Botanical Gardens! This place is a disappointment as there is nothing to DO here except stand at the guardrail and look at the pond. There is no walking trail. We drove past it TWICE not realizing it was even the 'point of interest' we were looking for. 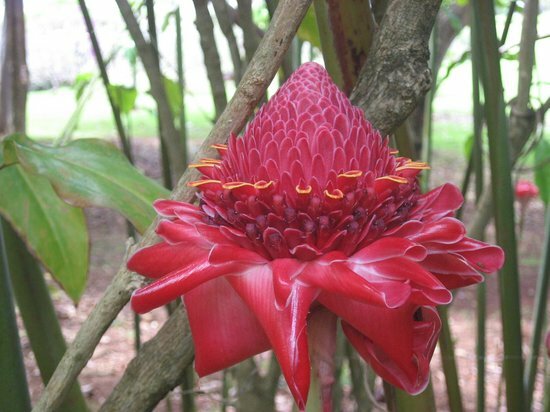 One of the loveliest experiences in my life was the day we rented a bright red kayak and paddled the serene Hanalei River. 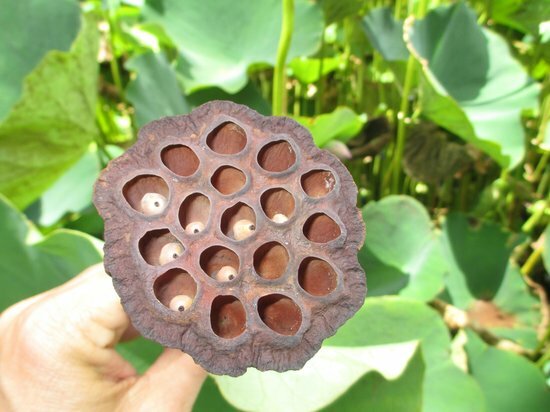 I could hardly believe my eyes at first because I was seeing FLOWERS, lots of flowers floating past us on the river. Was there a festival or wedding upstream where people were tossing flowers into the river? No! It was the tall shrubs of hibiscus flowers (and another type I didn't know) dropping its flowers on the river. This would be the perfect place to learn to paddle board and we saw several while we were on the river. There were also outrigger canoe teams. Take plenty of water and use sunscreen. We were not bothered by any insects. This is the home of an active religious group. They have instructive signage so you can learn about the various scultptures you see. They also have a nice bookshop. The scenary is beautiful and architecture is interesting. Definitely worth a visit, but call first because there are rules about when visits are permitted and tours are usually only on Fridays. Open toed shoes are not allowed. Sarongs are provided for you to wear while there. 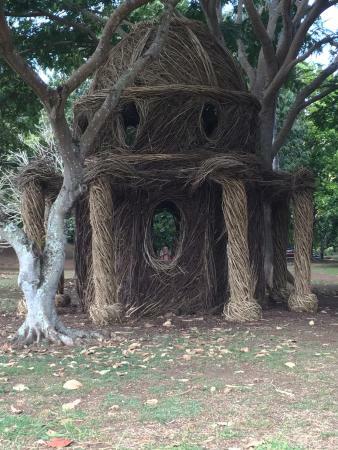 This is a relatively new addition to sightseeing in Kauai. The driveway entrance is quite close to the overlook for Opaeka Falls. There is ample parking when you reach the bottom of the driveway. 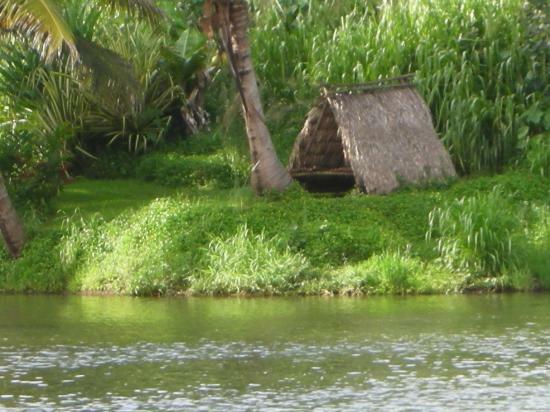 At Kamokila you can rent kayaks for the Wailua River. 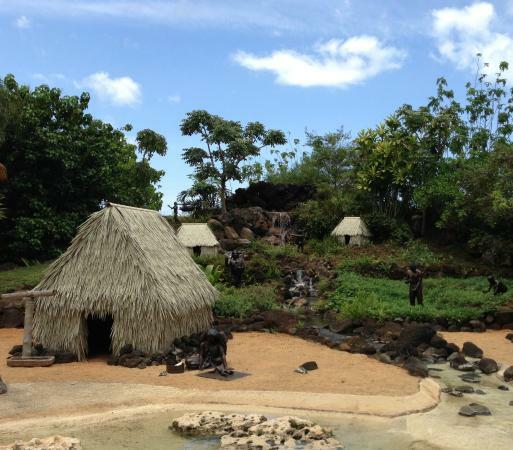 And you can tour the Hawaiian Village. 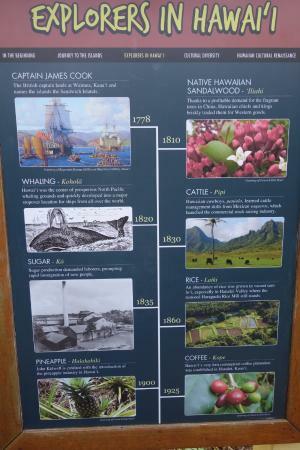 I think it is wonderful that this attraction is providing an opportunity to learn more about ancient Hawaiian culture. There are a few explanatory signs -- and hopefully they will add more in the future. It would also be great if they had a few docents on hand. Perhaps in the future. In the meantime, it is one of the best bargains price-wise on Kauais. And is in a lovely setting on the river, so definitely worth a visit. 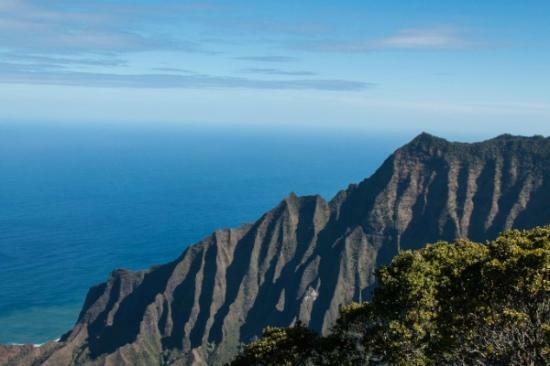 I REALLY recommend a visit to the Kalalau lookout. The terms 'breathtaking' and 'awesome' are overused, but in this case they are the only ones that seem appropriate. This view is stunning. This is the 'end of the line' for the paved road. 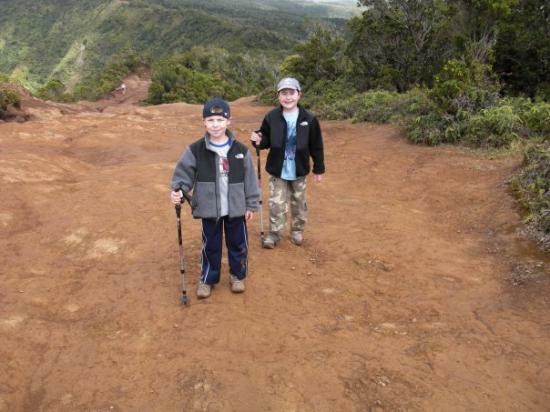 If you want to go further there are hiking trails. We were there on a beautiful clear day but even so the surface of the trails was so uneven that we gave up after only about 10 minutes. When wet I think they would be impossible. 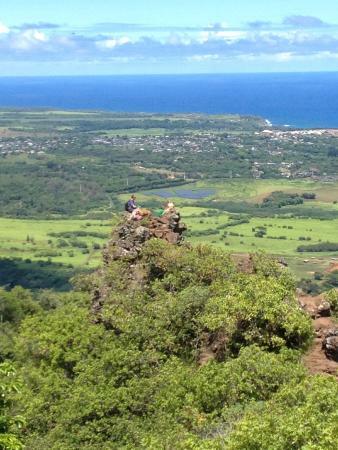 But even if you can't hike just soak up the glorious view! Good restroom facility at the parking lot.